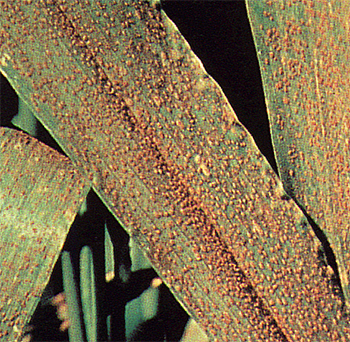 Leaf rust produces circular to oblong brown uredia (pustules). 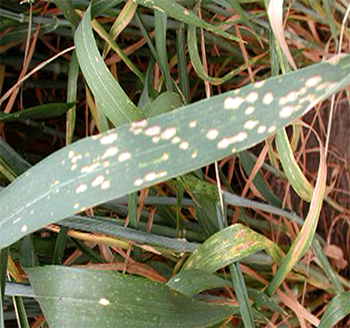 Pustules are smaller than those of stem rust, bigger than those of stripe rust, and they are not arranged into stripes. Leaf rust pustules are most often found on leaves, and are hard to see on other plant parts. 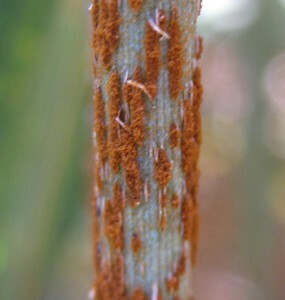 Stem rust produces elongated reddish uredia (pustules). Pustules are bigger than those of both stripe rust and leaf rust, and they are not arranged into stripes. Stem rust pustules are common on leaves, stems, and other plant parts. Black telia (pustules) are formed within a few days after the production of uredia. Powdery mildew pustules can be big or small, developing into white-grayish cotton-like patches on leaves and stems. Small black dots (sexual structures) are often formed on the pustules. Pustules do not form stripes. PLS is a complex problem, common in the U.S. Pacific Northwest. It is not caused by any fungi or bacteria. The problem is associated with the deficiency of chloride and/or zinc in the soil. Diseased plants have chlorotic or necrotic round to irregular spots or blotches that range from very small and up to 1-2 cm long. The center of the blotches are usually light colored and later become dark as saprophytic fungi grow on the dead leaf tissue. Applying chloride early on in the growth season can reduce symptoms. C Stripe is caused by the fungus Cephalosporium gramineum and is a common disease in the U.S. Pacific Northwest. 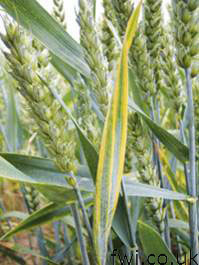 The disease initially shows up as continuous yellow stripes from the bases to the tips of leaves. The yellow stripes later change to dead tissue. 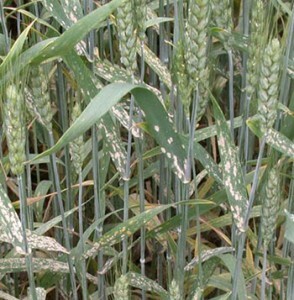 Plants in severely infected fields can produce white heads.